Ohio state policy allows students to earn dual credit for academic or CTE postsecondary courses taken at their high school, a postsecondary institution, or virtually. All public postsecondary institutions in the state are required to accept dual-enrollment credits (ECS, 2015). The Gateway to College National Network, KnowledgeWorks Foundation, and Middle College National Consortium have partnered with institutions of higher education to provide 11 Early College High School programs as part of the Early College High School Initiative (ECHSI;. Jobs for the Future, n.d.). "Ohio organizes CTE programs into seventeen Career Technical Content Standards that are based on the National Career Clusters Framework and state workforce requirements." 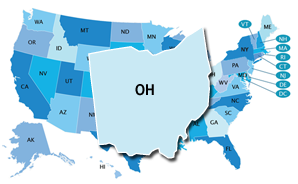 Ohio offers programs of study within all 16 of the Career Clusters. In Ohio, the Individual Academic and Career Plan (IACP) provides structure so that students and adults have a framework to guide their exploration, planning, and decision making. The components of the IACP support early explorers through experienced career seekers. The IACP contains the tools necessary for creating a comprehensive academic and career plan. Ohio's IACP is in use but is not mandated by the state. It includes all students in Grades 6–12. Ohio may have a state-specific Early Warning System, but the system is not publicly available.